Set against the Venetian backdrop and coinciding with the 2013 Venice Biennale, the Triptych Project combines the work of three artists from three different practices and origins — Katie Mixon, Kimberly Radochia and Jamie Tan — with a common curiosity for the physical, experiential and performative. After hours of viewing and discussing artworks around the island, the team could only agree on their overwhelming exhaustion, which begged the question: is this what we take away from art? So began an ongoing three day performative piece from three different starting points at the edges of the city. 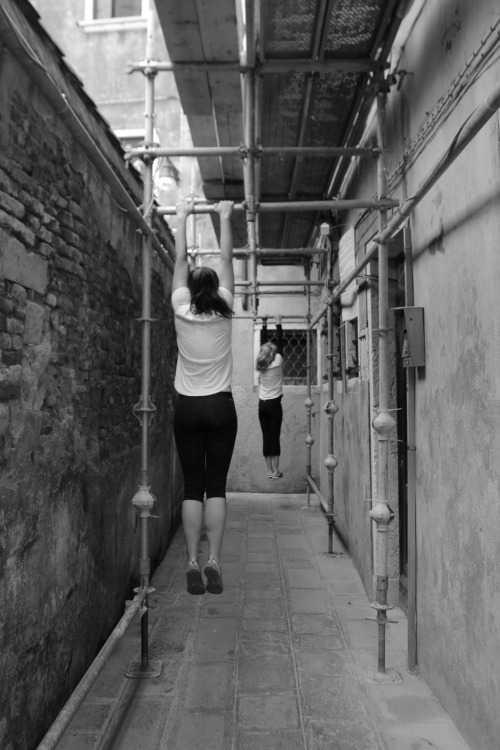 Using their bodies as props to physically interact and react with the unique Venetian architecture, the team's goal was to explore the boundaries of bodily limit by means of performing as many almost-impossibly demanding tasks, as an effort to claim back the energy stolen by the hard streets, concrete walls and steamy canals. They became both spectators and spectacles, occupying spaces and sometimes camouflaging among local inhabitants in order to observe the bridge between two worlds. This piece was exhibited at the Universati Cà Foscari di Venezia alongside five American artists for a three-week summer arts residency organized by the SMFA.